This article is about the historical concept. For the modern-day religious movement, see Messianic Judaism. Jewish Christians, also Hebrew Christians or Judeo-Christians, were the original members of the Jewish movement that later became Christianity. In the earliest stage the community was made up of all those Jews who accepted Jesus as a venerable person or the Messiah (Christ). 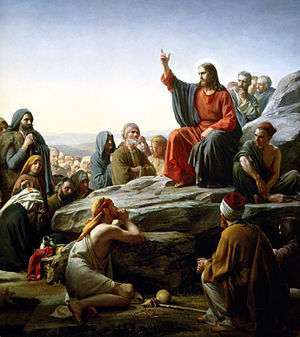 As Christianity grew and evolved, Jewish Christians became only one strand of the early Christian community, characterised by combining the confession of Jesus as Christ with continued adherence to Jewish traditions such as Sabbath observance, observance of the Jewish calendar, observance of Jewish laws and customs, circumcision, and synagogue attendance, and by a direct genetic relationship to the earliest Jewish Christians. 1st century "Jewish Christians" were totally faithful religious Jews. They differed from other contemporary Jews only in their acceptance of Jesus as the Messiah. Those that taught that Gentile converts to Christianity ought to adopt more Jewish practices than the Church had already included, however, were called "Judaizers". Though the Apostle Peter was initially sympathetic, the Apostle Paul opposed the teaching at the Incident at Antioch (Gal. 2:11-21) and at the Council of Jerusalem (Acts 15:6-35), where Paul's teaching was accepted by the whole Church. Nevertheless, Judaizing continued for several centuries, particularly among Jewish Christians. As Christianity grew throughout the Gentile world, Christians diverged from their Jewish and Jerusalem roots. Jewish Christianity, initially strengthened despite persecution by Jerusalem Temple officials, fell into decline during the Jewish-Roman wars (66-135) and the growing anti-Judaism perhaps best personified by Marcion (c. 150). With persecution by the orthodox Christians from the time of the Roman Emperor Constantine in the 4th century, Jewish Christians sought refuge outside the boundaries of the Empire, in Arabia and further afield. Within the Empire and later elsewhere it was dominated by the Gentile based Christianity which became the State church of the Roman Empire and which took control of sites in the Holy Land such as the Church of the Holy Sepulchre and the Cenacle and appointed subsequent Bishops of Jerusalem. Hebrew Christians — a 19th-century movement of Jewish converts to Christianity acting semi-autonomously within the Anglican and other established churches. though it is also used in some texts concerning the early church, and Arnold Fruchtenbaum applied the term to Jewish Christians standing aside from the Messianic Judaism movement. Hebrew Roots — A religious movement that embraces both Old and New Testaments but without the observance of the Jewish Talmud and many Jewish traditions not supported by Scripture. Christian Jews — a modern term which is frequently encountered in texts dealing with sociology and demographics. Judaizers — Early Christians who maintained or adopted Jewish religious practices, from the period of the inception of Christianity until approximately the fifth century. Judean Christians — Christians from Judea who were predominantly Jewish. Jesus was a Jew, and his renewal movement was Jewish. He preached in the Jewish countryside, not the Hellenistic cities. After his execution, his followers saw him alive, although in what sense historians do not know. They formed a community to wait for him to return, Later, this community separated from Judaism and became the Christian church. The Gospels represent a time when Christian theology was not fully formed and the separation from Judaism was not yet complete. It has been argued that this Jewish Christian sect (3,000 +) was in danger of being wiped out as they were being persecuted. The Acts of the Apostles depicts instances of early Christian persecution by the Sanhedrin, the Jewish religious court at the time, however the historical reliability of the Acts of the Apostles is disputed. Peter and John were imprisoned by a "Jewish leadership" ("the priests, the captain of the temple, and the Sadducees") who were "much annoyed because they were teaching the people and proclaiming that in Jesus there is the resurrection of the dead". The Sadducees in particular rejected the Pharisaic doctrine of the resurrection of the dead. Saint Stephen was tried by a Sanhedrin (Jewish Supreme Court) for blasphemy against Moses and God and was stoned to death, under the watch of Paul of Tarsus, before his conversion. A further blow to this Jewish sect was the death of their second leader (their first leader Jesus having been crucified c.30). According to Josephus, "the brother of Jesus, who was called Christ, whose name was James" met his death after the death of the procurator Porcius Festus, yet before Lucceius Albinus took office — which has thus been dated to 62. The High Priest Ananus ben Ananus took advantage of this lack of imperial oversight to assemble a Sanhedrin (although the correct translation of the Greek 'synhedion kriton' is 'a council of judges', see Synedrion for the Greek use of the word) who condemned James "on the charge of breaking the law," then had him executed by stoning. Josephus reports that Ananus' act was widely viewed as little more than judicial murder, and offended a number of "those who were considered the most fair-minded people in the City". Three events would greatly affect the fortunes of early Jewish Christianity. The first was the Conversion of Paul in the early 30's (and the possible conversion of his teacher Gamaliel), the second was the Council of Jerusalem c.50, and the third was the Destruction of the Second Temple in 70 AD, which according to Josephus was one of the most significant events of the First Jewish–Roman War. Nonetheless, according to the Church History of Eusebius, the line of Jewish Christian bishops of Jerusalem continued until the Bar Kokhba revolt (132-136) when Hadrian renamed the city "Aelia Capitolina" and barred all Jews except for the day of Tisha B'Av. After that, the Jerusalem bishops were uncircumcised Greeks. The Cenacle as it exists today is a Gothic reconstruction, but it may be the location of the original Jewish Christian church. Heinrich Graetz postulated a Council of Jamnia in 90 that excluded Christians from the synagogues, but this is disputed. Jewish Christians continued to worship in synagogues for centuries. According to Acts 15, the Council of Jerusalem c.50, customarily believed to have been led by James the brother of Jesus, determined that religious male circumcision (associated but also debated with conversion to Judaism) should not be required of Gentile followers of Jesus, only basic abstentions: avoidance of "pollution of idols, fornication, things strangled, and blood" (KJV, Acts 15:20, also Genesis 11:1-8 (idolatry), 9:20 (sexual depravity), 9:5 (cruelty to animals), 9:3-4 (abstention from blood)). The basis for these prohibitions is not detailed in Acts 15:21, which states only: "For Moses of old time hath in every city them that preach him, being read in the synagogues every sabbath day", stressing that they are Mosaic Commandments which Gentiles must pay attention to. Many, beginning with Augustine of Hippo consider the consensus emphasised the four stipulations based on the Noahide Laws stated in Genesis, and applicable to all people (Noah's descendants after the Flood). On the other hand, some modern scholars reject the connection to Noahide Law (Genesis 9) and instead see Lev 17-18 (see also Leviticus 18) as the basis. Some modern Christians are also unclear as to whether this meant that this Apostolic Decree in some way still applies to them or merely that the requirements were imposed to facilitate common participation by Gentiles in the community of Jesus' followers (which at that time included Jewish Christians), so as to remind the Jewish followers of Jesus to uphold those Laws applicable to them (i.e. the full Mosaic Laws). According to Karl Josef von Hefele, this Apostolic Decree is still observed today by the Eastern Orthodox. See also Biblical law in Christianity, Expounding of the Law, and Noahidism. However, even Barnabas, Paul's partner up till then, sided with Peter. Catholic Encyclopedia: Judaizers: The Incident at Antioch claims: "St. Paul's account of the incident leaves no doubt that St. Peter saw the justice of the rebuke." however, L. Michael White's From Jesus to Christianity claims: "The blowup with Peter was a total failure of political bravado, and Paul soon left Antioch as persona non grata, never again to return." See also Incident at Antioch and Pauline Christianity. Scholar James D. G. Dunn, who coined the phrase "New Perspective on Paul", has proposed that Peter was the "bridge-man" (i.e., the pontifex maximus) between the two other "prominent leading figures" of early Christianity: Paul and James the brother of Jesus. "...being brought over to the doctrine of Simon Magus, they have apostatized in their opinions from Him who is God, and imagined that they have themselves discovered more than the apostles, by finding out another god; and [maintained] that the apostles preached the Gospel still somewhat under the influence of Jewish opinions, but that they themselves are purer [in doctrine], and more intelligent, than the apostles." According to Eusebius' History of the Church 4.5.3–4: the first 15 Bishops of Jerusalem were "of the circumcision". The Romans destroyed the Jewish leadership in Jerusalem in year 135 during the Bar Kokhba Revolt. However, that does not necessarily mean an end to Jewish Christianity, any more than Valerian's Massacre of 258, (when he killed all Christian bishops, presbyters, and deacons, including Pope Sixtus II and Antipope Novatian and Cyprian of Carthage), meant an end to Roman Christianity. Traditionally it is believed the Jerusalem Christians waited out the Jewish–Roman wars in Pella in the Decapolis (see flight to Pella). After the Jewish–Roman wars (66–135), which Epiphanius believed the Cenacle survived, the significance of Jerusalem to Christians entered a period of decline, Jerusalem having been temporarily converted to the pagan Aelia Capitolina, but interest resumed again with the pilgrimage of Helena (the mother of Constantine the Great) to the Holy Land c. 326–28. According to the church historian Socrates of Constantinople, Helena claimed to have found the cross of Christ, after removing a Temple to Venus (attributed to Hadrian) that had been built over the site. For that reason she is seen as the Patron Saint of Archaeologists. Jerusalem received special recognition in Canon VII of the First Council of Nicaea in 325. Later, under Justinian I (527-565), it was designated one of the Pentarchy, though the Pentarchy has never been recognized by Roman Catholicism which instead claims Papal supremacy. A common interpretation of the circumcision controversy of the New Testament was that it was over the issue of whether Gentiles could enter the Church directly or ought to first convert to Judaism. This controversy was fought largely between opposing groups of Christians who were themselves ethnically Jewish. According to this interpretation, those who felt that conversion to Judaism was a prerequisite for Church membership were eventually condemned by Paul as "Judaizing teachers". The source of this interpretation is unknown; however, it appears related to Supersessionism or Hyperdispensationalism (see also New Perspective on Paul). In addition, modern Christians, such as Ethiopian Orthodox and Coptic Orthodox still practice circumcision (for both males and females, the latter of which the Jews never practised) while not considering it a part of conversion to Judaism, nor do they consider themselves to be Jews or Jewish Christians. Roman Catholicism condemned circumcision for its members in 1442, at the Council of Florence. Both Early Christianity and Early Rabbinical Judaism were far less 'orthodox' and less theologically homogeneous than they are today; and both were significantly influenced by Hellenistic religion and borrowed allegories and concepts from Classical Hellenistic philosophy and the works of Greek-speaking Jewish authors of the end of the Second Temple period... before the two schools of thought eventually firmed-up their respective 'norms' and doctrines, notably by diverging increasingly on key issues such as the status of 'purity laws', the validity of Judeo-Christian messianic beliefs, and, more importantly, the use of Koine Greek and Latin as sacerdotal languages replacing Biblical Hebrew...etc. Certain Christian communities of India, Syria, Lebanon, and Israel/Palestinian Territories have traditionally been associated with some 1st-century Jewish Christian heritage. The Syriac Orthodox Church, the Greek Orthodox Church of Antioch, and the Melkite Greek Catholic Church of Antioch are churches with known Jewish Christian membership that dates as far back as the 1st century. All three churches had common origins in terms of membership, where the majority of adherents was a mix of Greeks and Hellenized Jews and Syrians from Antioch and the rest of Syria who adopted the new faith. The Syriac Orthodox Church follows the Antiochene rite that celebrates liturgy in Syriac and still carries some particular customs that are considered today as purely Judaic in nature. Beyond Antioch, Alexandretta and Northwestern Syria, the main centers of Hellenistic Judaism in the Levant before the destruction of the Second Temple, the opening verse of Acts 6 points to cultural divisions between Hellenized Jews and Aramaic-speaking Israelites in Jerusalem itself: "it speaks of "Hellenists" and "Hebrews." The existence of these two distinct groups characterizes the earliest Christian community in Jerusalem. The Hebrews were Jewish Christians who spoke almost exclusively Aramaic, and the Hellenists were also Jewish Christians whose mother tongue was Greek. They were Greek-speaking Jews of the Diaspora, who returned to settle in Jerusalem. To identify them, Luke uses the term Hellenistai. When he had in mind Greeks, gentiles, non-Jews who spoke Greek and lived according to the Greek fashion, then he used the word Hellenes (Acts 21.28). As the very context of Acts 6 makes clear, the Hellenistai are not Hellenes." Some historians believe that a sizeable proportion of the Hellenized Jewish communities of Southern Turkey (Antioch, Alexandretta and neighboring cities) and Syria/Lebanon eventually converted to the Greco-Roman branch of Christianity that eventually constituted the Melkite Churches of the MENA area: "As Jewish Christianity originated at Jerusalem, so Gentile Christianity started at Antioch, then the leading center of the Hellenistic East, with Peter and Paul as its apostles. From Antioch it spread to the various cities and provinces of Syria, among the Hellenistic Syrians as well as among the Hellenistic Jews who, as a result of the great rebellions against the Romans in A.D. 70 and 130, were driven out from Jerusalem and Palestine into Syria." Some typically Grecian "Ancient Synagogal" priestly rites have survived partially to the present, notably in the distinct church service of the Greek Orthodox Church of Antioch and the Melkite Greek Catholic communities of the Hatay Province of Southern Turkey, Syria and Lebanon.
" The mixture of Roman, Greek, and Jewish elements admirably adapted Antioch for the great part it played in the early history of Christianity. The city was the cradle of the church." Members of theses communities still call themselves Rûm which literally means "Eastern Roman", "Byzantine" or "Asian Greek" in Turkish, Persian and Arabic. The term "Rûm" is used in preference to "Ionani" or "Yāvāni" which means "European Greek" or "Ionian" in Classical Arabic and Ancient Hebrew. Most Mid-East "Melkites" or "Rûms", can trace their ethnocultural heritage to the Greek and Macedonian settlers and Southern Anatolian Hellenized Jewish communities of the past, founders of the original "Antiochian Greek" communities of Cilicia and Northwestern Syria. Counting members of the surviving minorities in the Hatay Province of Turkey, in Syria, Lebanon, Northern Israel and their relatives in the diaspora, there are more than 1.8 million Greco-Melkite Christians residing in the Northern-MENA, the US, Canada and Latin America today i.e. Greek Orthodox and Greek Catholic Christians under the ancient jurisdictional authority of the patriarchates of Antioch and Jerusalem ("Orthodox" in the narrow sense) and/or their Uniat offshoots ("Catholic" or "united" with Rome). Jewish Christians are ethnic Jews who have converted to or have been raised in Christianity. They are mostly members of Catholic and Protestant congregations, and are generally assimilated culturally into the Christian mainstream, although they retain a strong sense of their Jewish identity. Some such Jewish Christians also refer to themselves as "Hebrew Christians". Examples include the Nasrani (Saint Thomas Christians) and Tamil-Portuguese Jews (Parava) of India, who historically have strong Jewish ties and still retain certain Jewish traditions. There is also a distinct movement of Hebrew Catholics in full communion with the Holy See. The 19th century saw at least 250,000 Jews convert to Christianity according to existing records of various societies. Data from the Pew Research Center that as of 2013, about 1.6 million adult American Jews identify themselves as Christians, most are Protestant. According to same data most of the Jews who identify themselves as some sort of Christian (1.6 million) were raised as Jews or are Jews by ancestry. According to 2012 study 17% of Jews in Russia identify themselves as Christians. The Hebrew Christian movement of the 19th century was a largely Anglican led, and largely integrated initiative, with figures such as Michael Solomon Alexander, Bishop of Jerusalem 1842-1845. Though figures such as Joseph Frey were more assertive of Jewish identity and independence. ↑ Hurtado, Larry W. Lord Jesus Christ: Devotion to Jesus in Earliest Christianity, 2005, p.211. "Also, if we itemize the instances of Jewish opposition/ persecution in the Acts narratives of the Jerusalem church, the leaders of the Hebrew Christians are more frequently on the receiving end (eg, Peter and John in 4:1-22;"
↑ Gallagher, Eugene V. and W. Michael Ashcraft, ed. Introduction to New and Alternative Religions in America, 2006, p213. "In the 1970s, Fruchtenbaum defined himself as a Hebrew Christian and was skeptical about the more assertive forms of Messianic Judaism." ↑ Kaplan, Dana Evan. The Cambridge Companion to American Judaism 2005, p. 412. "In contrast, four out of five secular and Christian Jews indicated that being Jewish was not "very important" to them. ... As compared with born Jews and Jews by choice, secular and Christian Jews generally feel positive about being Jewish, but it has few if any consequences for them and is not particularly important to them." ↑ James Carleton Paget, Jews, Christians and Jewish Christians in Antiquity (Wissenschaftliche Untersuchungen Zum Neuen Testament) (9783161503122) August 2010 Mohr, J. C. B. ↑ Book IV Chapter 5: "The Bishops of Jerusalem from the Age of our Saviour to the Period under Consideration"
↑ Karl Josef von Hefele's commentary on canon II of Gangra notes: "We further see that, at the time of the Synod of Gangra,  the rule of the Apostolic Synod with regard to blood and things strangled was still in force. With the Greeks, indeed, it continued always in force as their Euchologies still show. Balsamon also, the well-known commentator on the canons of the Middle Ages, in his commentary on the sixty-third Apostolic Canon, expressly blames the Latins because they had ceased to observe this command. What the Latin Church, however, thought on this subject about the year 400, is shown by St. Augustine in his work Contra Faustum, where he states that the Apostles had given this command in order to unite the heathens and Jews in the one ark of Noah; but that then, when the barrier between Jewish and heathen converts had fallen, this command concerning things strangled and blood had lost its meaning, and was only observed by few. But still, as late as the eighth century, Pope Gregory the Third (731) forbade the eating of blood or things strangled under threat of a penance of forty days. No one will pretend that the disciplinary enactments of any council, even though it be one of the undisputed Ecumenical Synods, can be of greater and more unchanging force than the decree of that first council, held by the Holy Apostles at Jerusalem, and the fact that its decree has been obsolete for centuries in the West is proof that even Ecumenical canons may be of only temporary utility and may be repealed by disuse, like other laws." ↑ "Epiphanius: Panarion". Geocities.com. Archived from the original on 2009-10-23. Retrieved 2009-05-05. ↑ "ANF01. The Apostolic Fathers with Justin Martyr and Irenaeus | Christian Classics Ethereal Library". Ccel.org. 2005-07-13. Retrieved 2009-05-05. ↑ On the Jerusalem Church between the Jewish revolts see: Jonathan Bourgel, From One Identity to Another: The Mother Church of Jerusalem Between the Two Jewish Revolts Against Rome (66-135/6 EC). Paris: Éditions du Cerf, collection Judaïsme ancien et Christianisme primitive, 2015 (in French). ↑ Catholic Encyclopedia: Jerusalem (A.D. 71-1099): "Epiphanius (d. 403) says..."
↑ "ECUMENICAL COUNCIL OF FLORENCE (1438-1445)". ↑ Daniel Boyarin. "Dying for God: Martyrdom and the Making of Christianity and Judaism" Stanford University Press, 1999, p. 15. ↑ "Antioch," Encyclopaedia Biblica, Vol. I, p. 186 (p. 125 of 612 in online .pdf file. Warning: Takes several minutes to download). ↑ Bar Ilan, Y. Judaic Christianity: Extinct or Evolved? pp. 297–315. ↑ Gundry, Stanley N; Goldberg, Louis, How Jewish is Christianity? : 2 views on the Messianic movement (Books), Google, p. 24 . ↑ "How many Jews are there in the United States?". Pew Research Center. 1 2 "A PORTRAIT OF JEWISH AMERICANS: Chapter 1: Population Estimates". Pew Research Center. ↑ "American-Jewish Population Rises to 6.8 Million". haaretz. ↑ "About us — Brief history". Ariel Ministries. Duling, Dennis C (2010). "The Gospel of Matthew". In Aune, David E. Blackwell companion to the New Testament. Wiley-Blackwell.